RiverCity CardioVascular has grown to be the largest, independent cardiology practice in San Antonio and central Texas. They have grown to 11 physicians across 5 area locations, and 5 satellite office in surrounding communities. Turning to us for all design services and direction, we started by developed a new logo that was bold, memorable, yet classic and timeless. The end product was put on signage, scrubs, lab coats, T-shirt’s, and promo items. We also designed all accompanying collateral such as business cards and stationary, a practice brochure, physician rack cards, referral pads as well as numerous publication ads. 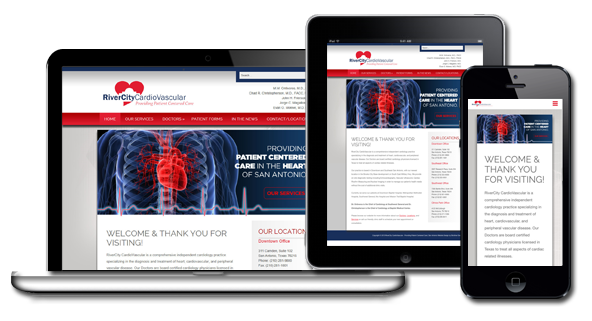 We also built their website to be fully responsive, showcasing their physicians, services, patient forms and area locations. The website is also a wealth of information with reference materials and publications.